I have been using these check valves, https://www.usplastic.com/catalog/it...3369&catid=489 in my CO2 system for about 3 years, with no failures yet. I have had, one in my tank, in the water, with CO2 going through it for all of that time, and it still works fine. They are made of plastics that are highly chemical resistant. Shipping costs for buying them drive up the cost substantially, but I still like them. I mistakenly bought the 3/16 inch size the last time, so it can be difficult to slip tubing over them, but they still work. The 1/8 inch size works much better. cool, order a couple from eBay with free shipping. I think I bought the 1/4" though. I learn a cool trick recently to slip small hoses over an oversized barb. Heat the hose in boiling/hot water. It'll slip right through and when cooled, it's an extremely tight seal. The pressure in the tube determines the water level. 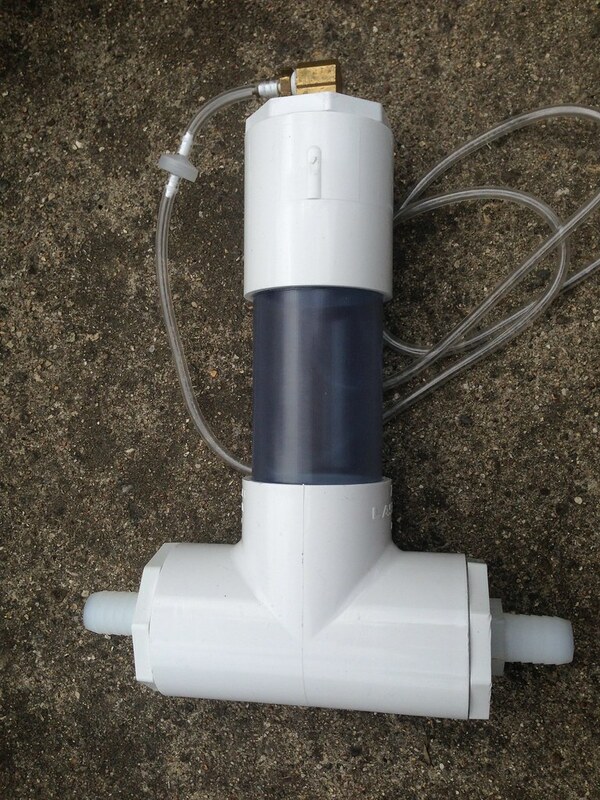 I released some pressure by pulling out the air tube and the water level rose into the clear tube part. I also hooked the CO2 line to a DIY yeast generator. Let's see where this goes. Ok, the yeast CO2 is enough to push the water level down. I've stopped the CO2 coming through by opening the CO2 bottle. I want to see if the water level rises back up as the CO2 dissolves into the water. One reason the water level might not go back up is that DIY CO2 has a lot of air mixed in, until many days later, and probably always has a significant amount of air. If it is pure CO2 the water level has to rise, since CO2 does dissolve in water very easily. It looks like you're right. The water level did move up a little as expected when most of the CO2 dissolved in the water, leaving behind most of the other gasses. I guess I'll have to wait till I get a refill on my CO2 tank. What I can do now is let all of the Non CO2 gasses purge out of the yeast bottle and the reactor chambers. It should be all CO2 by tomorrow. Last edited by mistergreen; 07-24-2018 at 07:41 AM.. I just read that temperature and pressure influences the rate of gass diffusion into water. The gass chamber is naturally high in pressure so CO2 diffusion should be greater than 1 atmospheric pressure. How much more specifically I don't know. I'd need to find a pressure gauge and a formula to calculate. Once the chamber is filled with pure CO2, I guess I can time how long it takes for the volume of CO2 to dissolve into water. Your CO2 diffuser device has its own built-in pressure gauge; just measure the depth of the CO2/water interface in the pipe below the surrounding water. Each inch of water depth displaced is equal to 0.036 psi greater than ambient pressure. Edit: I'm assuming the device is inside the aquarium, so the aquarium water level is pushing back against the CO2-enriched gas pressure in the tube. If this is all outside the tank, then info above may not apply. yeah, the device is outside the tank, attached to a canister filter. I like your thinking though. I'll look into it. 3.93 cubic inch of CO2 dissolved into the water. Keep in mind that gases are diffusing BOTH WAYS at the interface: CO2 from your diffuser gas to the aquarium, and N2 and O2 from aquarium to diffuser gas (assuming the diffuser gas is lower in those components). This is similar to how diving beetles and spiders use an air bubble as a "lung" to extract oxygen out of the surrounding water. The change in gas volume is not really a good measure of how much CO2 has dissolved. yeah, I hadn't thought about the gas exchange coming from the other end. I'm seeing the a change in rate of pressure as it goes on. I'll post a graph later. I have a drop checker in a 29G tank to make sure CO2 is dissolved in the water. It does go from blue to green. I was just thinking, this system is impossible to gas/kill your fish. The rate of CO2 is somewhat constant so this is another 'Pro'. Any excess CO2 would leave the chamber and out the tank without dissolving in the water and the rate of dissolving drops over time. Last edited by mistergreen; 07-25-2018 at 05:50 PM..